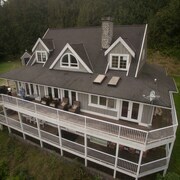 This beachfront romantic vacation home is located in Monroe. Well managed, cheerful staff, super clean. Breakfast was good. Breakfast was good but lack seating. Thought there was a hot tub. Usually there is when there’s an in door pool but still enjoyable. The only complaint was that we can hear the walking from the room above us at times...heavy footed people? Overall stay was great! The hotel was nice and updated and the rooms were great! Where to find Monroe hotels near an airport? Where can I find hotels in Monroe that are near tourist attractions? For those travelers searching for accommodations near Monroe, there are several options. Within a 0.1-kilometre (0.06-mile) distance of its central area, you can find 4 Expedia-listed accommodation options. Monroe offers visitors a selection of centrally located hotels, including the Best Western Sky Valley Inn and Evergreen Inn and Suites. 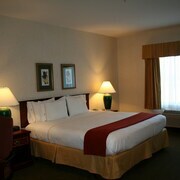 Our extensive database offers only a small selection of economical lodgings in Monroe. The Monroe Motel is one such listing. Check out the Willows Lodge as well as the Hotel Bellevue. The Willows Lodge is located 19 kilometres (12 miles) from the middle of Monroe. The Hotel Bellevue, is located 30 kilometres (20 miles) away. Two more hotel options include the Woodmark Hotel and Still Spa and the Residence Inn by Marriott Seattle Bellevue. After you've seen Monroe, you should leave time to explore the other attractions in the Puget Sound area. Puget Sound has forests and fjords. Popular Puget Sound visitor sites are lighthouses. In this region of United States of America tourists can partake in hiking, quad biking and beach combing. The closest places to spend the night in Everett include Marysville and Mill Creek. Marysville is 30 kilometres (20 miles) to the northwest of Monroe, while Mill Creek is 17 kilometres (11 miles) to the west. 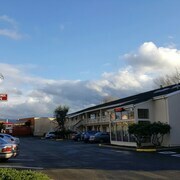 Hotels in Marysville include the Tulalip Resort Casino and Comfort Inn. 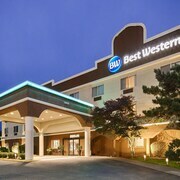 While Mill Creek apartments and hotels are the Holiday Inn Express & Suites Everett and La Quinta Inn Everett. If you are really into sports and really like games you could head to Safeco Field, which is 40 kilometres (25 miles) to the southwest of Monroe. Those sports fans wanting to stay near to the sporting action can select from the Four Seasons Hotel Seattle or the Seattle Marriott Waterfront. Seattle - Tacoma International Airport is a convenient airport for arriving in Monroe. It is 50 kilometres (32 miles) drive away. 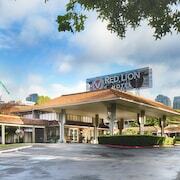 If you choose to stay nearby, try the Seattle Airport Marriott or Cedarbrook Lodge. What are the most popular Monroe hotels? Are there hotels in other cities near Monroe? 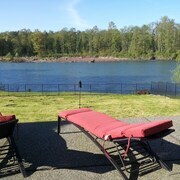 What other types of accommodations are available in Monroe? Explore Monroe with Expedia.ca’s Travel Guides to find the best flights, cars, holiday packages and more!